Look, up in the sky: it’s a bird, it’s a plane … it’s Bob Holiday playing Superman on Broadway. Like his predecessors who portrayed the Kryptonian hero on film, Holiday soared through the air, of course. But unlike them—or his successors, for that matter—he did so in real time in the theater. And he sang, too. Though Holiday is remembered above all for his portrayal of the Man of Steel, he made his debut on Broadway in an even more successful work, Fiorello! (1959), a musical about the popular three-term Mayor of New York, Fiorello La Guardia. With a book by Jerome Weidman and George Abbott and music by Jerry Bock, Fiorello! won multiple Tony Awards, including Best Musical, as well as the Pulitzer Prize for Drama. Tom Bosley starred as La Guardia, and Holiday had a small role as the law clerk Neil. 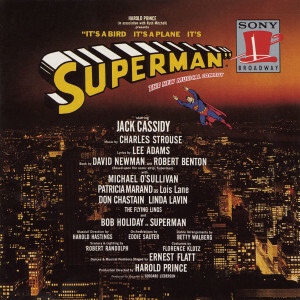 But in 1966 Holiday flew into center stage as the comic-book hero Superman in It’s a Bird … It’s a Plane … It’s Superman, a musical by Charles Strouse, Lee Adams, David Newman, and Robert Benton; Hal Prince directed. Also in the cast was Broadway great Jack Cassidy. 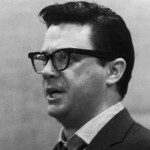 The musical received three Tony nominations, was hailed by the press, and received extensive media attention – Holiday even appeared as Superman on the television game show I’ve Got a Secret to teach host Steve Allen how to fly. Nevertheless, the musical itself never fully took off and closed after 129 performances. Holiday reprised the role in 1967, playing in open-air theaters, and Columbia Records issued an original Broadway cast recording. Holiday also starred in a 1964 touring production of Camelot, playing Sir Lancelot alongside that legend of movie musicals, Howard Keel. But Holiday’s fame rests with his performance as Superman. “Having played Superman was a special and lasting honor for me,” Holiday has said. “People still remember this show and tell me how much they enjoyed it. It’s deeply rewarding because I have always been a Superman fan.” In fact, he even wrote a book, with Chuck Harter, called Superman on Broadway.